If you like the scenic and dramatic landscapes and the kind of literature that concerns adventures about marvels, shenanigans, and chivalric romance, you might be enchanted with this medieval corner of Greece. 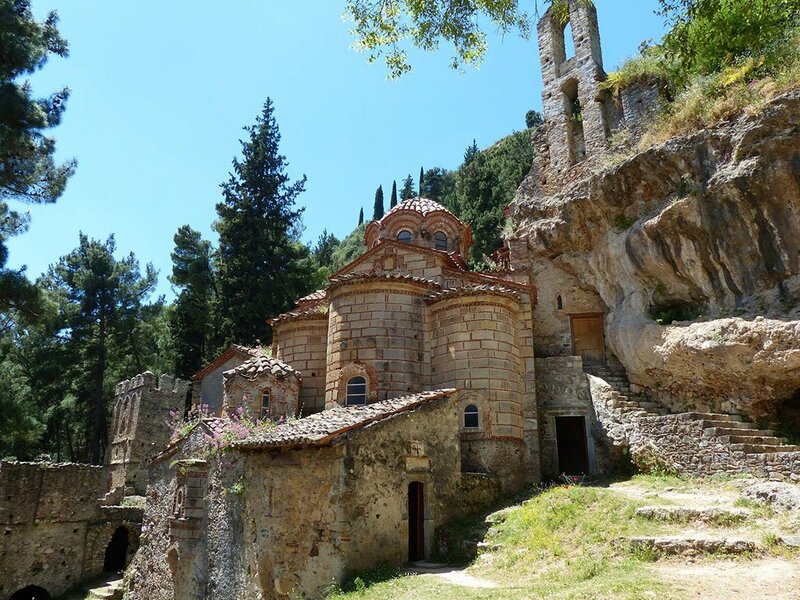 As a general rule most of our guests have never heard of Mystras before we stop for a visit. Also as a general rule they tend to love the place. Mystras, located in the region of Laconia, namely the southeastern side of the Peloponnese, is not just a roadside stop, but a UNESCO-listed World Heritage site and one of the most important historic places in Greece. It is also surprisingly beautiful and not a particularly touristy site, although the nearby modern village has several taverns, a few souvenir shops, four or five hotels and a few rooms to rent. 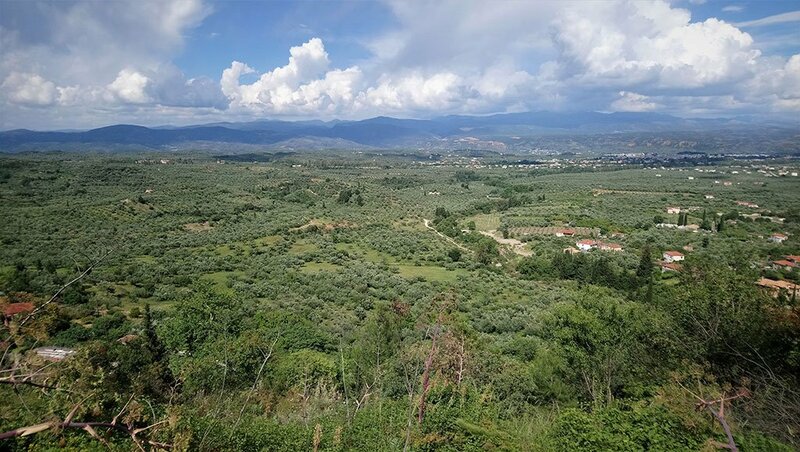 The site is on the slope of a steep flank of Mount Taygetos and provides great views over the plain of Eurotas river and the site of ancient and modern Sparta, situated just four miles to the west. 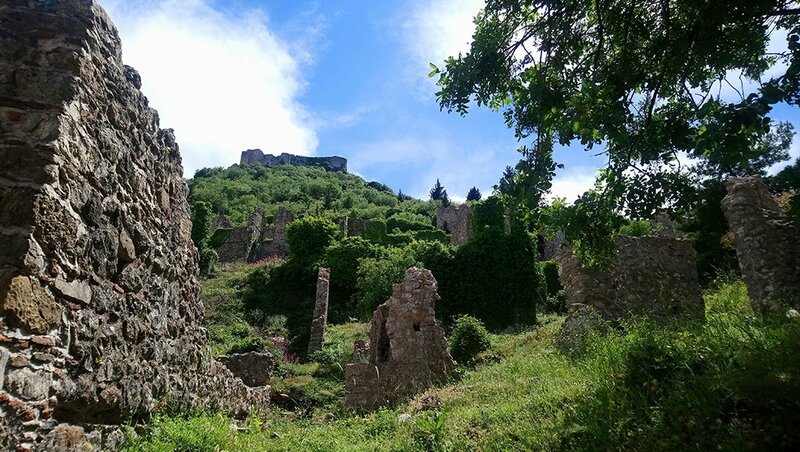 Strolling around its medieval paved lanes, one come across its bright greenery and balmy flowers mixed with the remains of renown palaces and monasteries, houses, fountains, and gates, all standing petrified and silent below the mountain. Today the sights are primarily churches, all of them of a great architectural and artistic interest; indeed, most of them are decorated with high quality frescoes from the 13th to 15th centuries. In the old days Mystras was one of the most important intellectual and cultural centers of the Byzantine Empire and a great meeting point between the Eastern Orthodox and the Western Catholic world. The castle at the top of the hill is actually the place where it all began. It was founded in 1249 by the Frankish ruler of the Peloponnese, William II the Villehardouin. At that time and after the pillaging of the 4th Crusade in 1204  and the plunder of the Byzantine capital (Constantinople, nowadays Istanbul), the Frankish lords divided the peninsula into feudal baronies under a common ruler entitled as the “Prince of Morea” (the medieval name of the Peloponnese). Unfortunately for the Franks though, their presence to the southern parts of the peninsula was relatively short. About a decade later, Mystras was ceded to the Byzantine emperor as ransom for the release of William II, who had been captured in a battle soon before the final Byzantine reconquest of Constantinople in 1261. Thus, two years later, this small but geographically strategic Frankish fortress was to turn into an immensely large and important Byzantine castle-town occupied primarily by former residents of the nearby Lakedaimon, better known as ancient Sparta. The first governors of Mystras settled on a plateau below the castle of approximately 6 hectares that formed the upper town and the administration center. The lower town, much more densely inhabited, provided enough space to accommodate the high aristocracy and a number of affluent and lavish clerical establishments. From the mid-14th century and during the final critical decades of Byzantium, Mystras served as a capital of the Peloponnese with a local ruler called “despot” who was normally member of the Byzantine imperial family. The place was thus home to high clerics, officers and the Byzantine royalty and soon turned into an intellectual hub of the Palaiologan Renaissance  : the final flourish of letters and art which has often been associated with the Renaissance that was about to thrive in Italy the moment that Byzantium was collapsing in the mid-15th century. Most famous among the Byzantine intelligentsia was for certain Georgios Gemistos Plethon , a Late Byzantine philosopher and humanist scholar of colossal importance. Plethon rediscovered the ancient Greek philosophy and especially the works of Plato who had been ignored in the West during the Middle-Ages. Being in constant communication with the Latin States, he introduced his works to the Italian peninsula and he contributed immensely to what we know as Renaissance, i.e., the rediscovery of the ancient Greek and Roman scholarship and art that we now consider as the end of the medieval era. The cultural dialogue with the West and the Crusader East were also reinforced by marriages between Byzantine rulers and Latin princesses. Isabelle de Lusignan from the royal house of Lesser Armenia and Cyprus was the first countess married and settled in the region. Her bilingual heritage is mirrored today in the family crests of the Lusignan on the exterior of her monastic institution (upside lions and fleur-de-lis) as well as in the gothic architectural elements that decorate Mystras’ churches. Aside the architecture of Mystras, which is of an exceptional character, the interior of the churches is clearly the highlight. 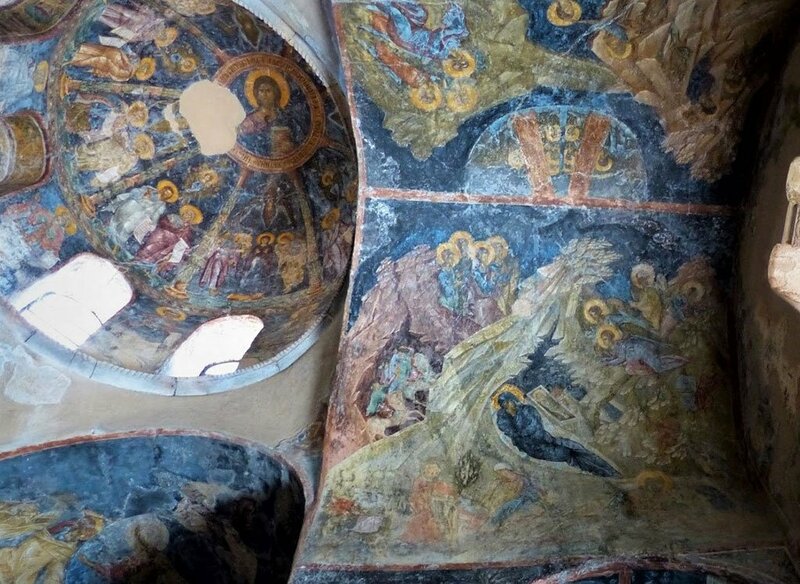 Most of the them bear striking frescoes that follow the orthodox byzantine tradition faithfully and they are of the highest quality, second only to what was happening in Constantinople itself during the last crumbling decades of the Empire. 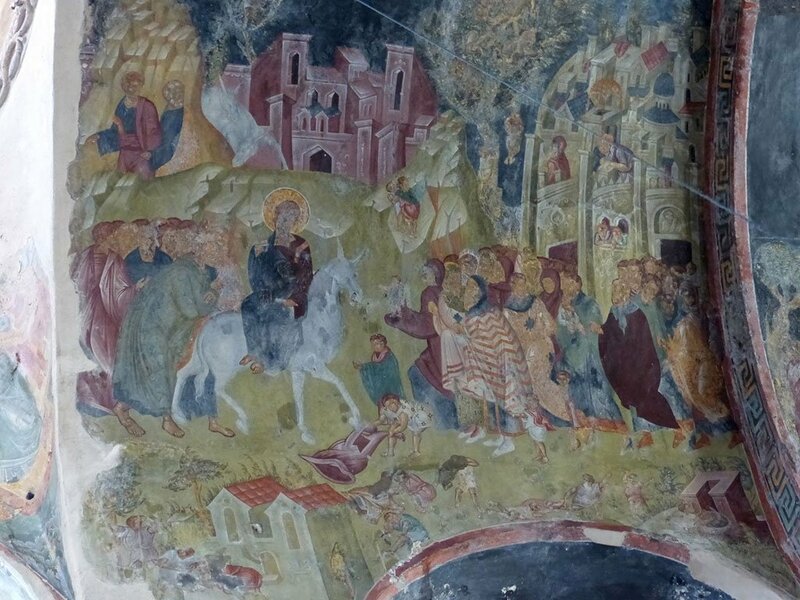 Our image shows the late 14th century paintings of Perivleptos monastery, founded by the first “despot” of Mystras, Manuel Kantakouzenos, and his wife Isabella. At the central dome dominates the image of a stern-looking Christ Pantokrator (ruler of all) surrounded by apostles and prophets. At the barrel-vault on the right of the picture, the scene of the Nativity of Christ exhibits exceptional execution and knowledge of the most up-to-date trends of the capital. In spite of its simplicity, the image stages deep spirituality and balanced drama expressed through the calm figures, the warmth of Virgin Mary depicted in the centre and the very powerful rocky mountains that frame the Christological event. 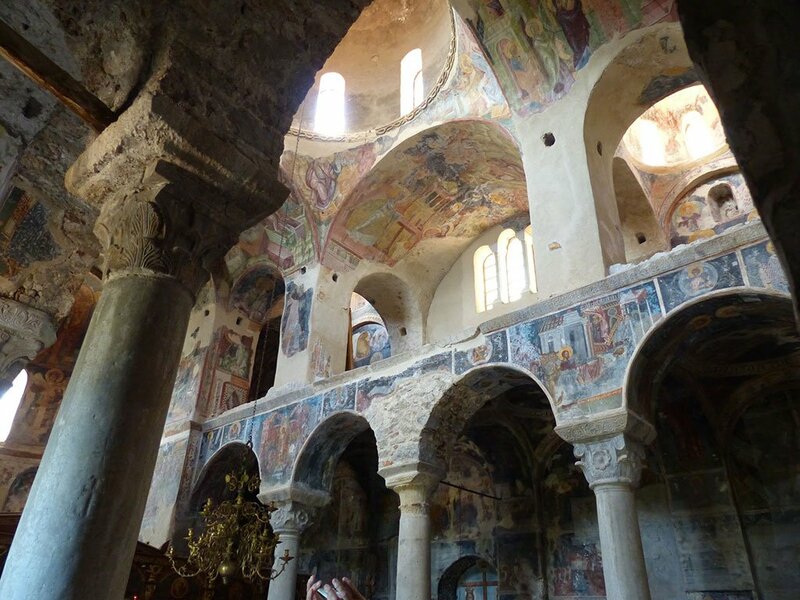 This is a small sample of the magnificence of Mystras. 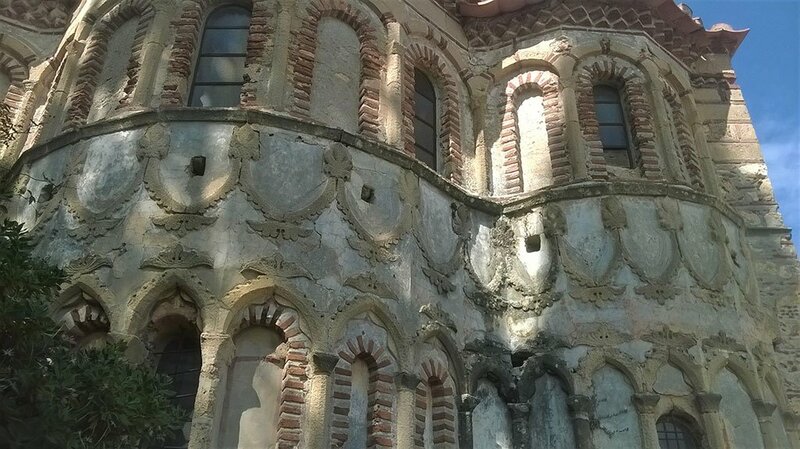 And again much more could be said and written about the people and the intellectual and political trends that led to the last expression of the Byzantine art and made Mystras the symbol of the revived classicism.